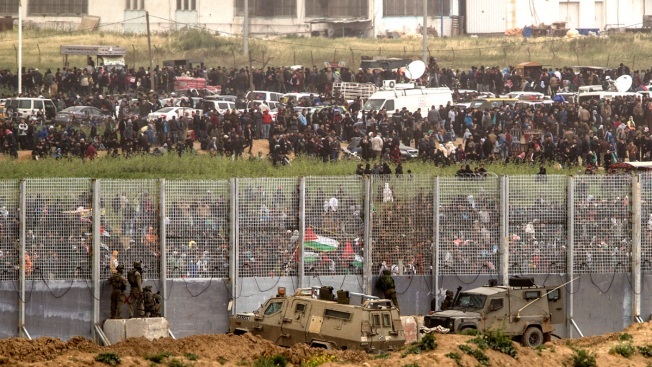 Israeli soldiers take positions on the Israel and Gaza border during a Palestinian protest, Saturday, March 30, 2019. Tens of thousands of Palestinians have rallied at points near the Israeli border to mark the first anniversary of weekly protests in the Gaza Strip, as Israeli troops fired tear gas and opened fire at small crowds of activists who approached the perimeter fence. At least one Palestinian was killed and 24 protesters were wounded by live fire, according to Palestinian medical officials. A cease-fire deal appeared to take hold between Israel and Gaza's Hamas rulers on Sunday, with Israel expanding the permitted fishing zone and easing some tight restrictions on movement through its two main crossings with the Palestinian enclave. Egyptian mediators have worked in recent days to broker a cease-fire agreement, but talks have been repeatedly interrupted by Palestinian rocket attacks and Israeli military reprisals. The violence has heightened tensions just over a week before Israeli national elections. In a sign that Egyptian efforts have made progress, the Gaza fishermen's committee said Israel would be extending the permitted fishing zone along the Mediterranean coast to a maximum of 15 nautical miles (28 kilometers), up from the previous limit of nine nautical miles (17 kilometers). Fishing had been off-limits since Gaza militants launched a rocket toward Tel Aviv last week, touching off rounds of short but intense cross-border fighting between the bitter enemies. Israeli officials confirmed that the reopening of the fishing zone would go into effect Monday. The lifting of some restrictions on the passage of people and cargo in and out of Gaza further indicated a strengthening of the cease-fire, which Hamas officials say would see Israel easing its blockade in exchange for guarantees of quiet. Israeli and Hamas officials confirmed that the Erez and Kerem Shalom border crossings were re-opened, in a very restricted fashion, for the first time since violence flared up last Monday. The first steps toward the restoration of calm were nonetheless punctuated by exchanges of fire along the border. Just hours after Israel announced the re-opening of its main Gaza crossings Sunday, a mortar shell was launched from the Gaza Strip toward Israel, the army said. 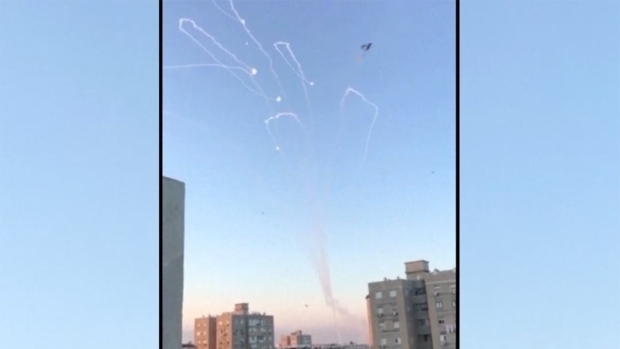 The projectile did not cross into Israeli territory but did set off air-raid sirens in the country's south. There was no immediate claim of responsibility, and no immediate Israeli response. Earlier Sunday, Palestinian militants launched rockets into Israel during the night, and the military responded with tank fire. Here is a look at the jarring scenes from Monday’s U.S. Embassy opening in Jerusalem and the violence at the border in Gaza 40 miles away. Four Palestinians, including three teenagers, were killed by Israeli fire on Saturday as tens of thousands of people took part in mass rallies that marked the first anniversary of demonstrations along the Israel-Gaza perimeter fence. Dozens of activists approached the fence during Saturday's demonstration, hurling stones and explosives toward Israeli forces. Israel says it is defending its border but has come under heavy international criticism for the large number of unarmed Palestinian demonstrators who have been shot over the past 12 months. Nearly 200 Palestinians have been killed by Israeli fire, while one Israeli soldier was killed last summer by a Palestinian sniper in Gaza. Associated Press writer Ilan Ben Zion contributed reporting.